A woman to die for; The Banshee. An Irish spirit or fairy that delivers a loud wail that serves as an omen that someone is about to die, and once the Banshee's wail ends, that person drops dead. Or she was once a murdered woman, or a woman who died during childbirth. There is also a form of trap where if someone finds a comb on the road, the banshee will come and spirit the poor soul away. The Banshee's story begins as a Fae women, who laments over funerals of important persons and their families and later, possessing the ability to foretell death. In the Scottish Highlands, she is known as the Bean-nighe or bean sith, which is a spirit that washes away the blood from clothes and/or armor of people about to die. So she shares a dual citizenship with both Ireland and Scotland. Her appearance varies, from an old hag to a beautiful woman, or even the Irish Battle Goddess, The Morrigan. Her attire is usually grey or white, but is also said to dress in a variety of colors. Even the Banshee's trademark wail description also varies, from being so strong it can destroy glass to being a low, pleasant song. The most common sound comparison is a combination of a woman's wail and an owl. Many Irish or Scottish families often believe that a Banshee is attached to them whose wail foretells that a member of the family is about to die. When multiple banshees wail together, that means someone great is about to die; with one family, The O'Brians, believed to have a Banshee named Eevul, with a retinue of a 25 banshee chorus. 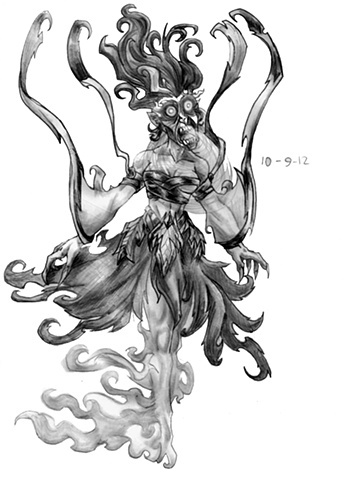 The Banshee story even traveled to the United States, but depicts her as a ghoul instead of a harbringer of death. She is also connected to another caller of death, The Dullahan (Irish Headless Horseman) and are often said to travel together to bring out the dead. For my depiction, I wanted to make the clothes move as if they have their own air while making her lower half slowly disintegrate into flaming mist. Her eyes I made into fiery balls to serve as her foresight of the impending dead. Her outfit is partial tatters with a leaven belt to connect her to the Fae Realms. The weird curves in her clothes and hair are directly influenced from the Magic card; Keening Banshee.